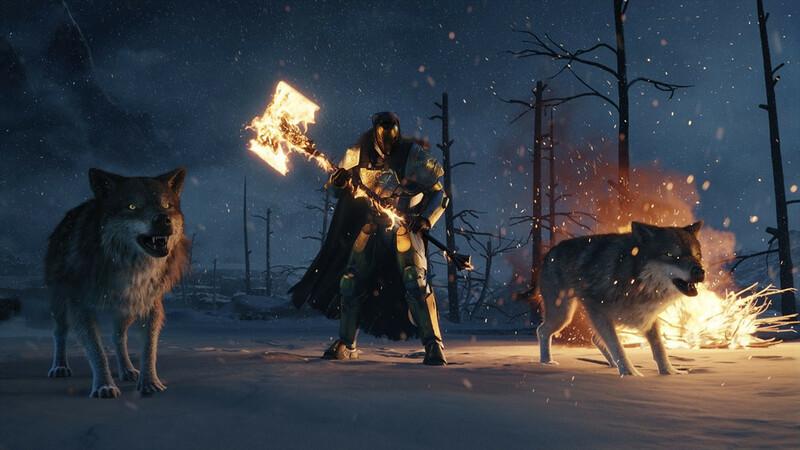 Andi shares his experiences with Destiny's latest expansion, Rise of Iron. When it comes to Destiny, you hear players describe themselves in a number of ways. "I've played since Day One", "I quit after Vanilla", "I came back for Rise of Iron – everything's so different!" I'm a mixture of the above. I grabbed the game on release day two years ago, and played through the content with my fiance 'Wild-Kit' and long-time gaming buddy 'AeisNyte'. After the Year One exodus, we were left with few people to play through end-game content with, so my partner and I left AeisNyte to save the galaxy by himself. I missed the releases for The Dark Below and House of Wolves, but returned with Wild-Kit a few months before the release of The Taken King. Bungie had done an impressive job fixing a number of issues, and AeisNyte had recruited a number of players into a solid little clan that we joined. We've been playing together since, and leading up to the release of Rise of Iron we finished all the game's available content. Our Moments of Triumph achievements were completed a week after they were announced, and Oryx was slain numerous times and in numerous ways. I wouldn't say we are as voracious as some Destiny addicts, but we're certainly looking forward to seeing what Bungie has in store for us. There's been some great accounts on the web of what it's like to come back to Destiny or start Destiny two years after its release, but I'm yet to see a journal of what it's like for those that have been there since (almost) Day One. I'm not trying to burn through the content as fast as possible, or get raid-ready for 'Wrath of the Machine' which launches this weekend. This isn't Gameplanet's official review of Rise of Iron, simply another perspective. 20:45 The whole clan is online, and the voice chat is bubbling with excitement. To pass the time, AeisNyte, Wild-Kit and I decide to get a quick Challenge of Elders out of the way before reset at 9pm. We won't finish a complete Sigil, but we can get one completion to get a faction package from Variks – and it beats hanging around in the Tower. 21:00 OK, so the Challenge is taking longer than expected. We decide to flag it and jump to orbit in order to get into the latest content. The first thing I want to look at is the new Year Three Record Book, which holds a number of rewards, milestones, and goals. It's been locked shut so far, and I'm eager to see what accomplishments are in store for the coming year. 21:01 Hmmm. Still waiting for this book to open. Uh oh. 21:02 Disconnected. Well, it's not like this is the first online game to suffer server issues on release day. 21:30 Bungie's error messages all reference an animal in order for people to quickly tell support what issues they're having. The entire clan are reporting an 'Error: Tapir', which was rather amusing to begin with, but it's been half an hour, and there's been no sign of progress. Queue it up: MMO style! 21:45 Tapir continues to plague the Destiny community. Reddit is having some fun with it, as are parody accounts on Twitter. I'm just glad the expansion has a new soundtrack that we're being graced with at the moment. It's certainly no score from Martin O'Donnell, but it's a vast improvement from the moody grumblings of The Taken King. 21:55 We're in a queue now! Sure, there's 20,244 people ahead of me... but it's something! 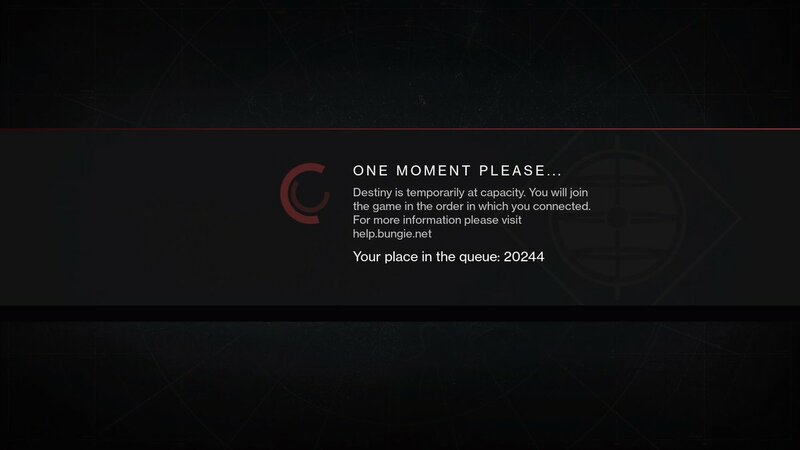 22:30 AeisNyte, who was 2,000 behind me in queue has just been kicked. As he's saying it, my screen goes to black and I feel like I'm about to meet the same fate. But just as I'm getting ready to call it for the night, the character selection screen pops up. I'm in! Wild-Kit and AeisNyte aren't so lucky. She still has more than 200,000 in front of her, while Aeis has been kicked to the back of the queue. They both bid me farewell and head to bed. I jump on my Hunter and load in. I don't want to go through the story without them, so instead plan to patrol the new zone: The Plaguelands. 22:45 Turns out I'm going to have to get through a few missions first before the patrol mode will unlock. 'King of the Mountain' is a great first mission and introduction to both the SIVA threat, and the Iron Temple – the game's new social area set way up in the snowy peaks of Earth. Still no patrol. I'm going to try the second mission 'The Walls Come Down' to see if that unlocks it, but if not I'll call it for the night. 23:00 I'm reminded of just how formidable the enemies can be when you start new content. The Taken from the previous expansion were troublesome as hell upon release, but are no more than a nuisance these days. Rise of Iron's SIVA infected fallen have me taking cover, using my super, and nursing my shield and health bar. There's new enemy AI I'm yet to figure out, and some great up-close-and-personal mobs that certainly contradict the sharpshooter style I play on my Hunter. Can't wait to get back in here with my alt Titan. 23:15 I've scanned a computer and gotten some intel which I've been ordered to take back to the Temple for analysis. Upon doing so I'm set upon another mission. Still no patrol, so I call it a night. As the Flight of the Conchords say... "it's late, and I've got work in the morning." Check out Day Two here. A Destiny: Rise of Iron journal.